It is 2015 - Do You Know What Your Brand Looks Like in Google and Bing? 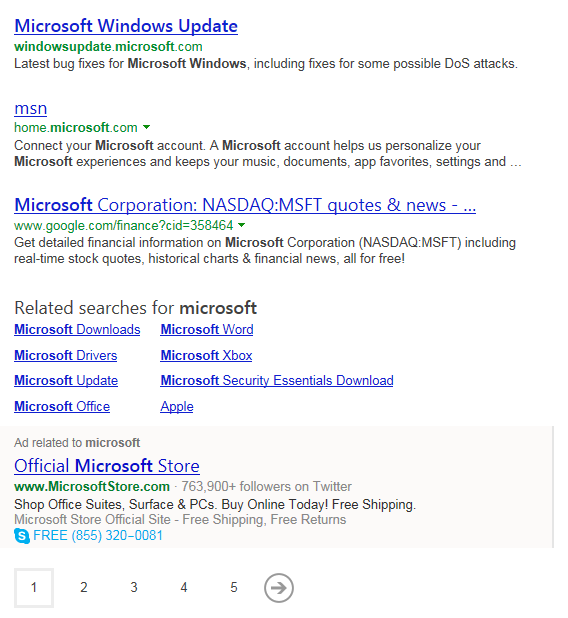 You are here: Home / Bing / It is 2015 – Do You Know What Your Brand Looks Like in Google and Bing? 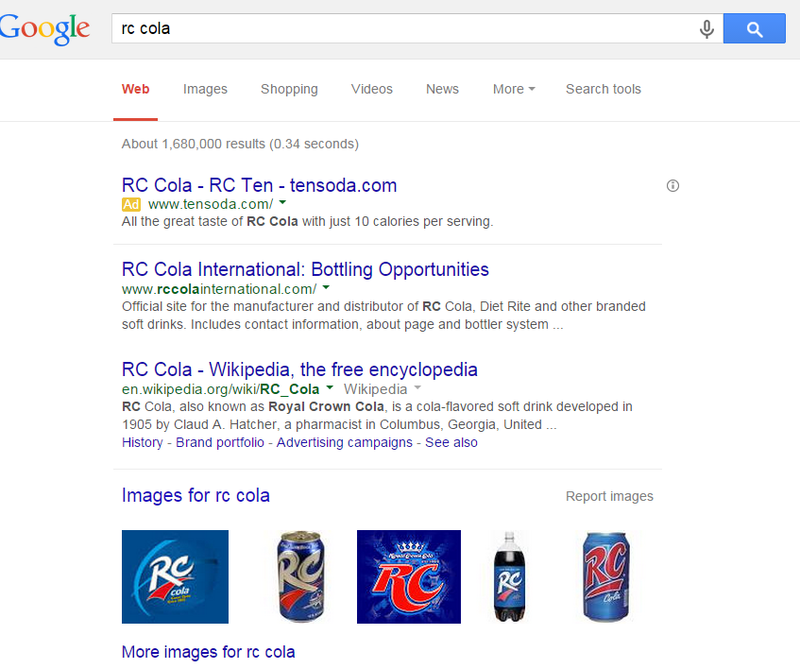 Who really likes RC Cola anyway? Like the soda/pop or not, their own Web presence gets as much love from Google as its brand recognition, when also compared to Coca Cola. In 2015, Google and Bing provide both bigger and smaller brands with all the avenues they would need to improve the way the search engines provide a Branded Search Result (BSR), which can range from strong to weak from my perspective. I classify strength by the level of “ownership” by the brand Web site and its own social media pages of the top seven main (non-indented) organic (non-paid) results – ideally consisting of seven “main” links on the first page of results within Google. The remaining links are mostly other properties owned by the brand, including some having strong sub-domains or other Brand social media entities or Web properties represented. 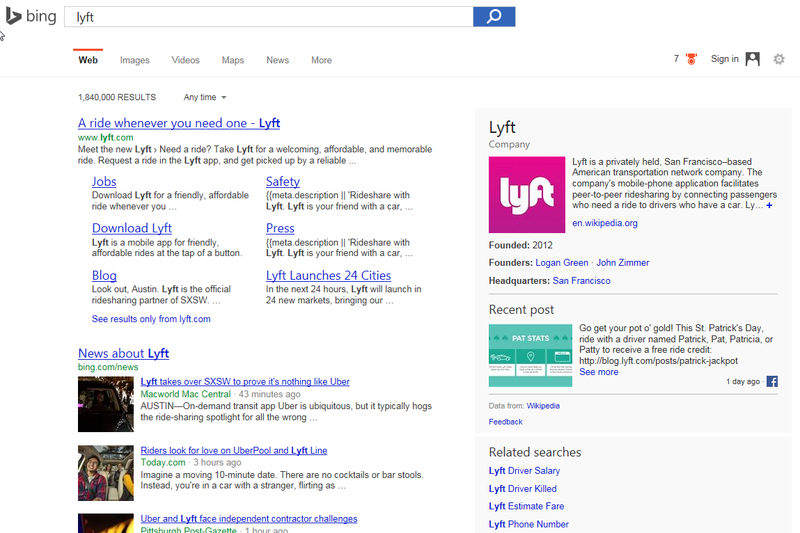 Bing does things in a very similar fashion above the fold. 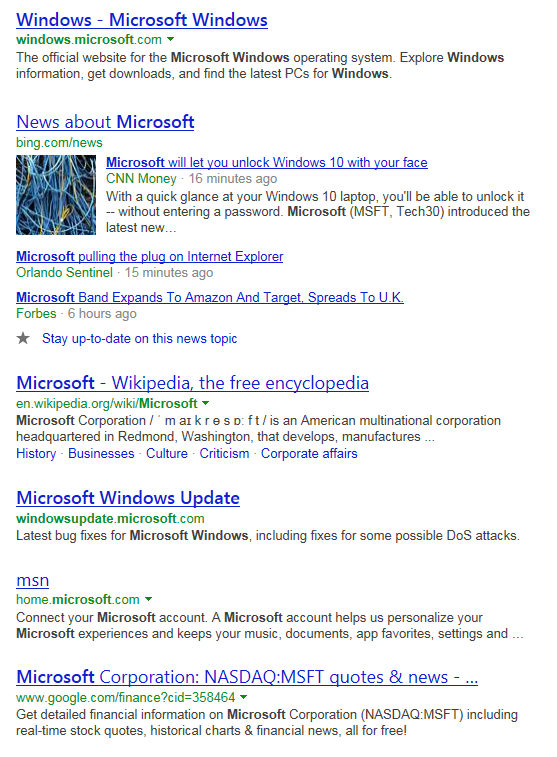 I used Microsoft as the search example to show you that they are not afraid to show the competition in their right-side experience. But I think Bing gets away from the “neater” arrangement Google completes for a brand listing by cutting it off to 7 listings on the first BSR page. In fact, you have to scroll twice to finish screen-capturing this BSR in Bing. Also note there are no competitors that make their way below the fold in this instance. 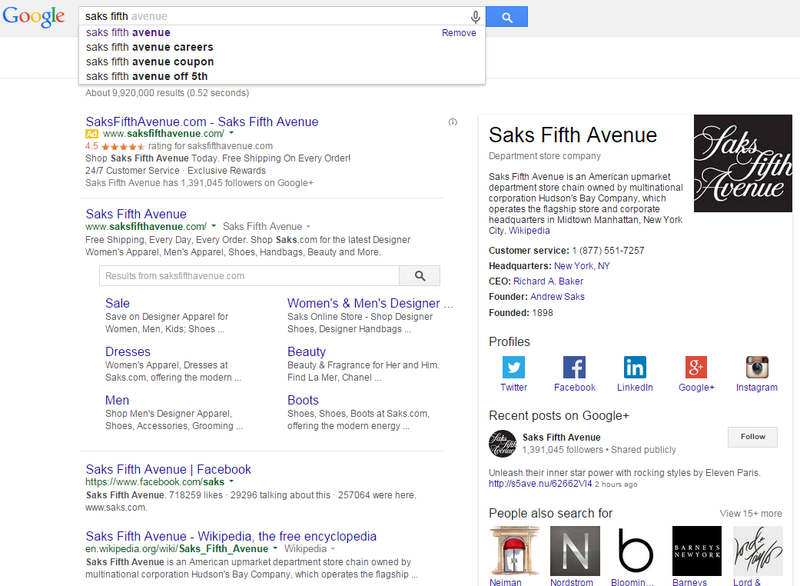 Can Only Big or Established Brands Get the Strongest Brand Search Results? 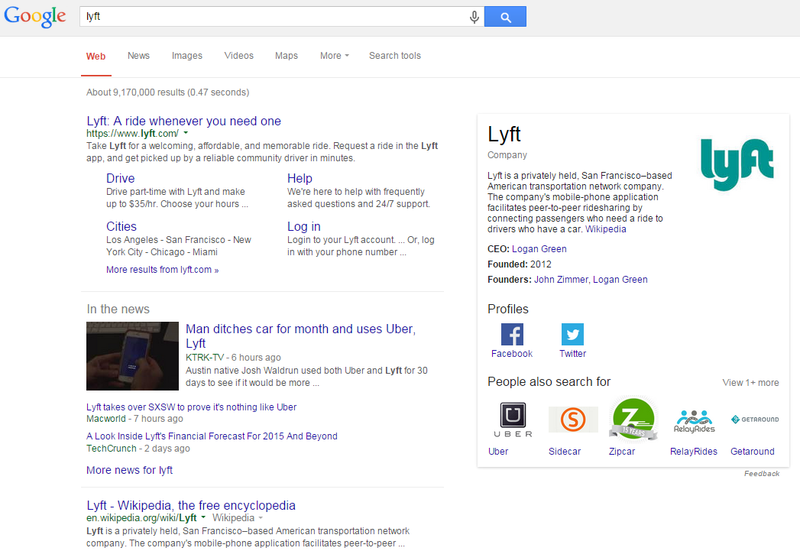 One could argue that Bing has actually created a better first-year experience for the Lyft BSR than Google has. However, one difference is the choice of the use of the Facebook page and not the Google + Business page, from a real time messaging perspective. Smaller Brands that are new get love at least within personalized searches for entities the searcher has interacted with in the past. Not everyone gets these partially exposed graphs, but they do exist for some to consume. Also, many smaller businesses may compete with the Local Results, if their business name is also a “broader” search term. In research for this article I came across a sad instance of this case. 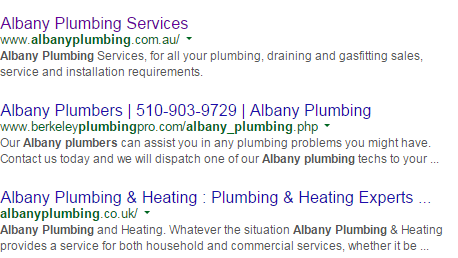 I searched for “Albany plumber” originally and saw albanyplumbing.com on the first page of results but below the Local pack. 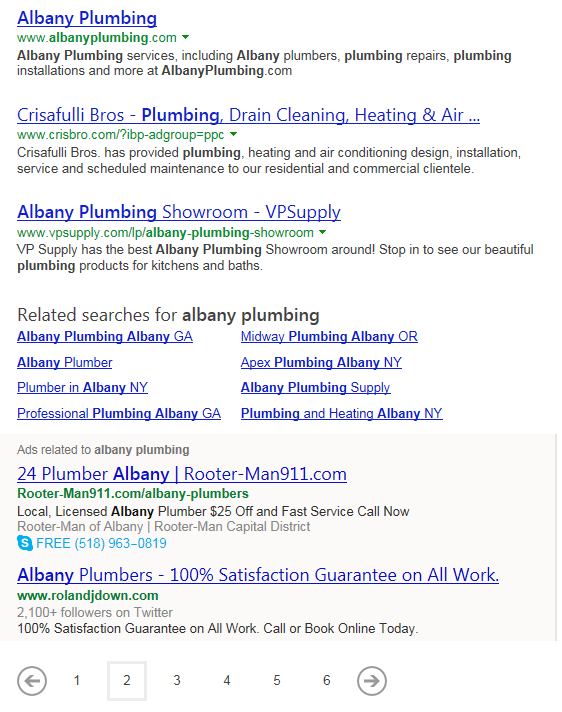 When I switched my search to the term “Albany plumbing,” I was still regionalized to close to Albany NY, but could not find albanyplumbing.com anywhere. Without researching much further, I suspect that the poor folks that own albanyplumbing.com may be the victim of their own brand name and some form of filtering. I cannot find data in the quick couple tools I checked to be able to validate this, but it is important for business owners that have broad names to keep in mind that BSR pages will likely vary greatly from the stronger pages. 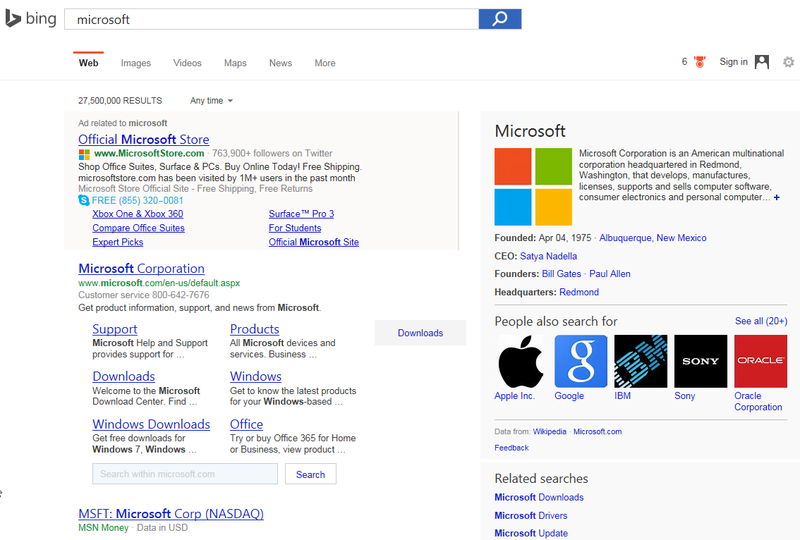 At least they have Bing, where they are found near the bottom of the second page. One argument that comes into play with this topic is the “Google favors big brands” fear. 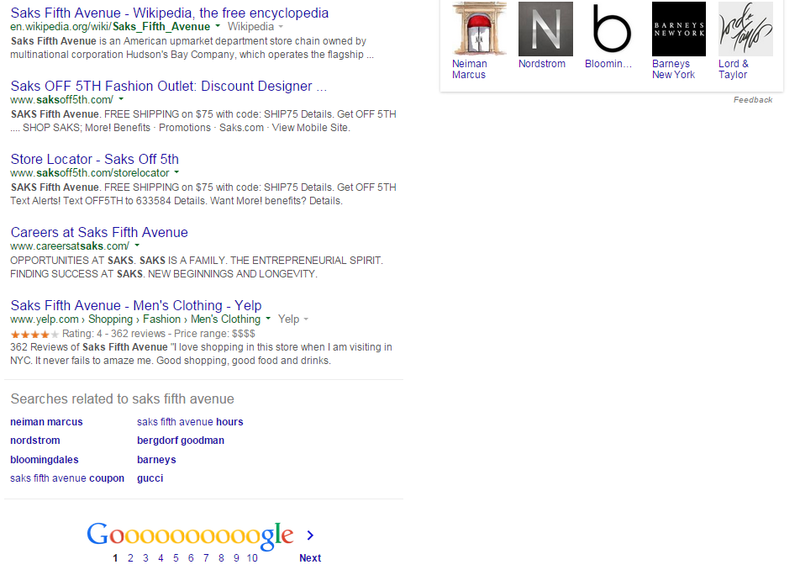 Certainly this is a process of means and not a planned collaboration between big brands and Google and Bing. The larger brands can have greater diligence and ability to afford proper care for their social media entities, as well as promote signals that will validate the brands eminence. However, all brands should understand and try to promote owned content within Brand Search Results pages in 2015, given the real time indexation and validation that Google and Bing technology are able to provide in unison. Chris has been involved in digital marketing since 2000, helping dozens of clients directly with their SEO, Paid Search, Analytics, and Social Media. He has spoken at conferences and partner events all over the world about search engine marketing, social media, and integration tactics including the promotion of better SEO integration across marketing channels. Chris grew up in Europe, Australia and the United States, and speaks conversational French and Dutch. Chris proudly served in the USMC, and is a soccer coach/player and golf caddy for his son in upstate New York.